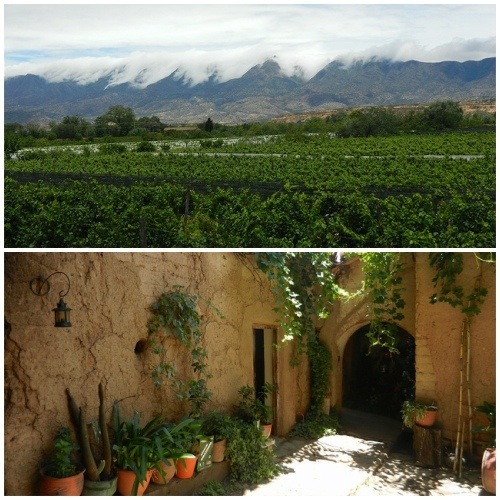 Tarija isn’t one of the world’s better known wine regions, but it does produce some of the world’s highest altitude wines. 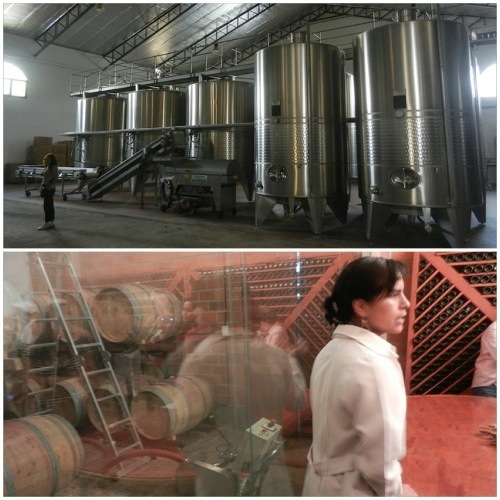 Whilst Bolivia can’t stand up to Chile and Argentina (read more here), it does produce some surprisingly drinkable wine at a low price, so we were quite looking-forward to our wine tour of Tarija. Plus it also included cheese and jamon Serrano tasting. What’s not to like about that? We started off at 9am (!) with Casa Vinícola El Potro. It was small! Everything – the processing tanks, bottling facilities, storage cellar – were in the same building. This was real ’boutique’ production. I wanted to like it, I really did, but the wine just tasted weirdly sour. The olives and crisps we got to eat with it were more my kind of thing. Next was Campos de Solano, which is my second favourite brand in Bolivia (Aranjuez is the absolute best). 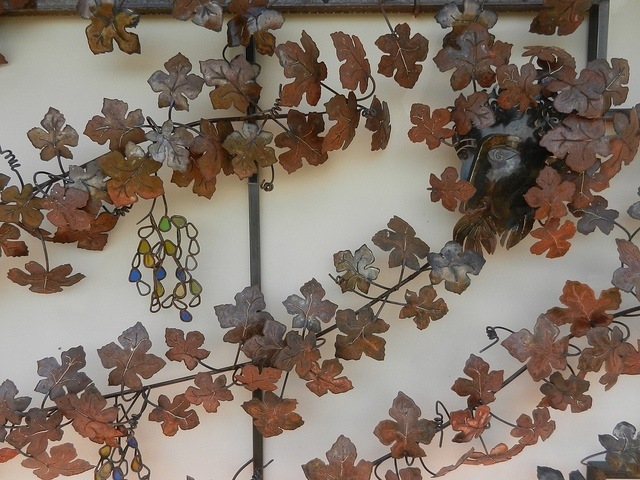 It was the most professional and largest of the wineries we visited and wouldn’t have looked out of place on the wine tours we did in Chile or Argentina. 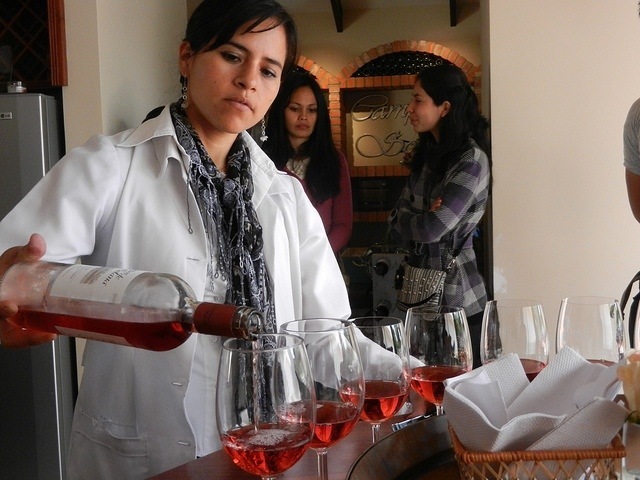 Campos de Solana are the only producers of rosé in Tarija – nice and refreshing in the hot weather! Bodegas Casa Grande was one of the more interesting vineyards we visited. They’re in the process of building a wine spa and the place actually looked like they worked there rather than it being just for show for tourists. The white wine we tried was pretty good – it reminded me a little of a pinot grigio. This was also the place we got to sample local ham and cheese. And there was a cute puppy running around. You can’t get much better than that! We made a brief stop at a showroom for Las Duelas. They make lots of desert wine, marmalade and other organic fruity products. 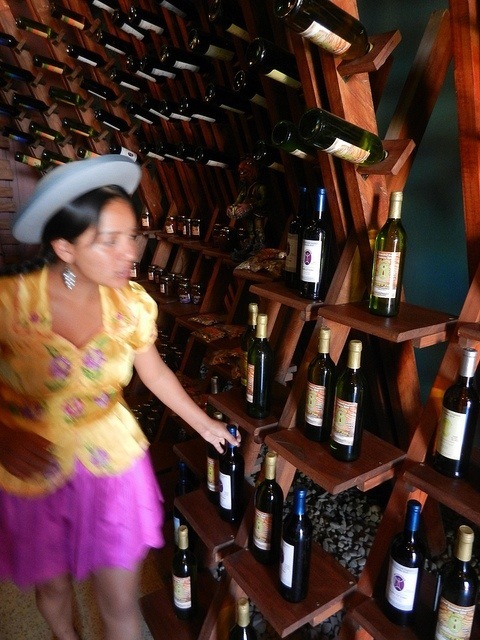 Finally, we ended the tour at Casa Vieja, the oldest bodega in Tarija. This is the place where you share one glass with the whole group during wine tasting. It’s traditional. It also means the person at the end of the line gets to finish off whatever’s left in the glass. We were served in such rapid-fire fashion that I lost count of how many types of wine and singani we tried. None of them were very memorable. But Casa Vieja’s charm lies in its colonial buildings, restaurant and beautiful terrace. We decided to skip the tour bus back to Tarija and stayed here for lunch (delicious but very slow). A shared taxi back to Tarija cost only 5Bs per person. 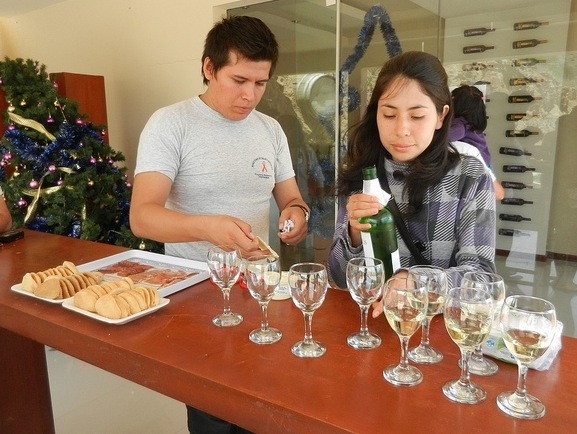 Wine tours start from 100Bs for a half day. We went with Viva Tours, 150Bs, because we wanted to visit Campos de Solana and specifically avoid Kohlberg (seriously the worst wine in the whole world). 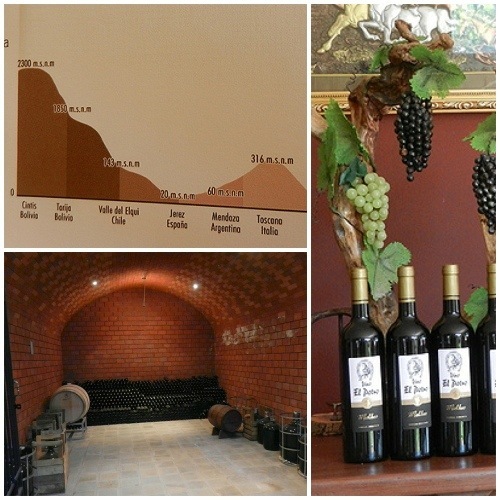 This entry was posted in Bolivia, Eating & Drinking and tagged cheese, jamon, Tarija, Vineyard, wine, wine tour by Rosanna. Bookmark the permalink. Fascinating. I hope I’m not the only person on the planet unaware that Bolivia produced wine! Still love your blog: it gives me itchy feet. Glad you still like “In search of unusual destinations”. Phil. Well, Bolivia is certainly an unusual destination in terms of wine (most of it is not very good). Glad you enjoyed the post! 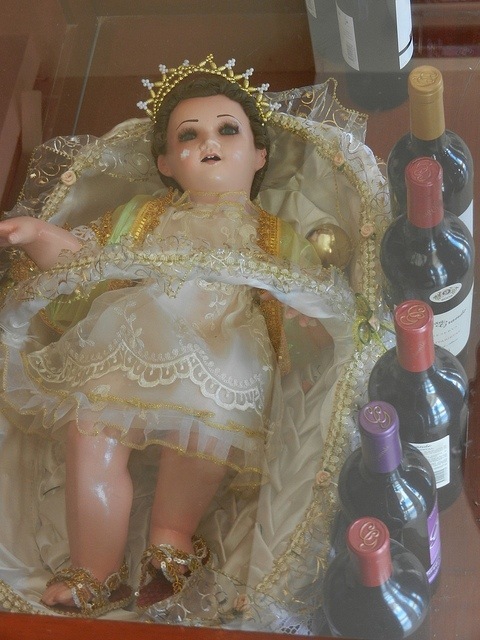 We are thinking of making the trip to tarija and the main reason for this is to check out the wines. Do you think it is worth it? We will have to travel by overnight bus from either potosi or Sucre, or maybe Santa Cruz (whichever makes the most sense once we can find someone to point us in the right direction!). I guess I am really just keen to k ow your thoughts on the area and if it is worth a side trip there from the centre of bolivia. You may not check this in the next day or so, but if you do, I’d be ever so grateful for your thoughts! Thanks in advance, I hope! 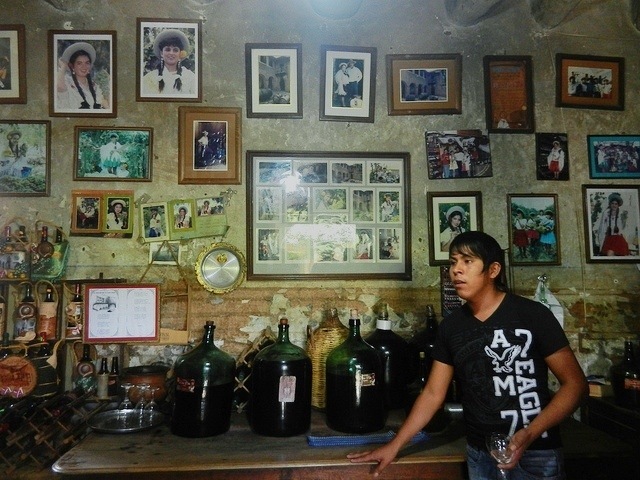 If you actually care about wine, Bolivian wines will be disappointing. However, I would still recommend Tarija as it is a really lovely part of the country and culturally very different from elsewhere (I have some other posts on here about Tarija). Are you interested in outdoor activities? The Tarija region has lots of opportunities for hiking, biking etc. Do you speak Spanish? I think you’ll get much more out of the trip if you do, as no one spoke English when we were there. Also, if you do end up on an overnight bus from Sucre, you’ll arrive in the early hours of the morning. There are a few hotels around the bus station, but not all of them answered the door at 4am. We did find somewhere eventually though, so you should be fine. Thank you sooooooooooo much for the ridicously prompt reply! I’ve had a read of all your relevant blogs for us, very helpful and interesting! Thanks so.much again for your assistance, great appreciated. Hopefully the overnight buses will work out timing wise so we can bus it down easily and then check into the little hostel you mentioned to. Copycat…!